Hotel ibis budget Luebeck City Sued. Book now! Free Wifi! 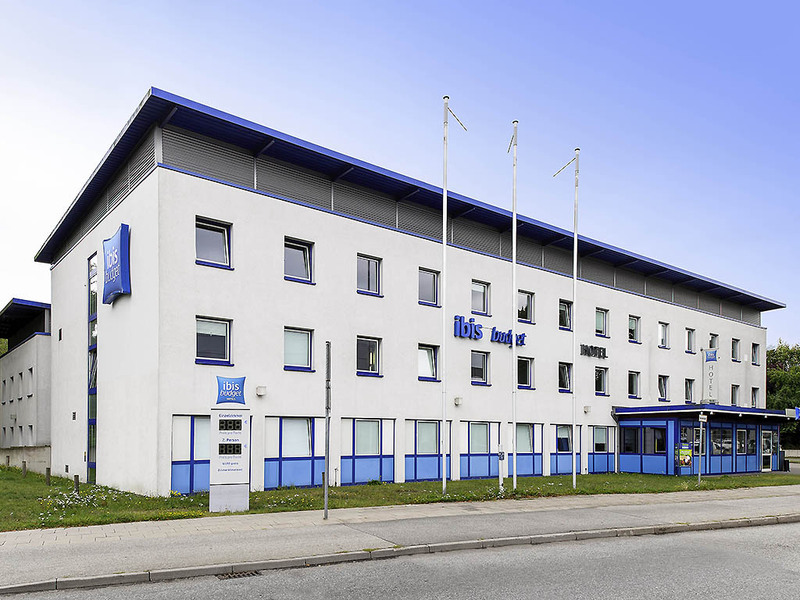 The ibis budget Lübeck City is situated only a few minutes from the city centre and from the A1 and A20 motorways. The hotel has 79 comfortable rooms, each of which can accommodate up to two adults and one child below the age of 12. Wi-Fi access is availa ble free of charge. A tasty breakfast buffet ensures that you start the day on a good note. You can also use our free parking facilities adjacent to the building. Just came in after midnight and put our reservation code (too long!) to print out door code. Helped also very drunk customer in, allcodes were too long for him in that night. Hit the hay and get up to shower - working. Breakfast was a pretty nice. Thank you. Good clean basic hotel, convenient location. The bed was extremle hadr and uncomfortable, we stayed 1 week! But perfect if you stay only one night. Thr floor in our room was dirty when we came and was NEVER cleaned during our stay, which is very strange! Otherwise, good budget hotel and very friendly staff! nice and friendly as allways, a warm stay in cold times. BUT - BUT ... with &quot;warm&quot; as keyword: the air provided by the ac-inlet led to an unpleasent red-eye-condition with the both of us (2). It seems that the ac-machinery / -system needs a serious cleaning! Room had everything I needed, was able to switch to a room that worked better for me, staff was very friendly and helpful. Check in easy , bathroom very dirty. The shower has not been cleaned . Dust around the window . I was satisfied. Only wish: you could have a more comfortable chair in the room. As always, we love to be in Berlinerstrasse, so nice and comfortable, personnel so friendly. It is almost like a home in Luebeck. Thank a lot again. We will come back at Christmas. Best greetigs, Familie M..
Had some trouble with the advanced paid breakfast. Friendly staff and a nice s.
We was staying only short time in Lubeck and your Hotel was good for our purposes. It was clean, breakfast was good and there was car parking . It was easy to walk to the center, so the Hotel's location is good. I was very happy with my stay at the hotel. For a budget hotel it was generally as I would have expected though the bathroom was significantly nicer than I would have thought. Despite being on a main road by a busy roundabout I was impressed by how soundproof the windows were and how well the blind blocked out the light. It was ideal for our purposes. Stay away if You, like me, are disabled or if your car is over five meters long. The rooms are not small but they are not properly utilised. Parking is for small vehicles, for example a Trabi, not for full sized passanger cars. Very correct price for the prestation.